Members of the 2019 middle school class of the Birmingham Etiquette and Protocol Academy. Photo courtesy the Birmingham Etiquette and Protocol Academy. 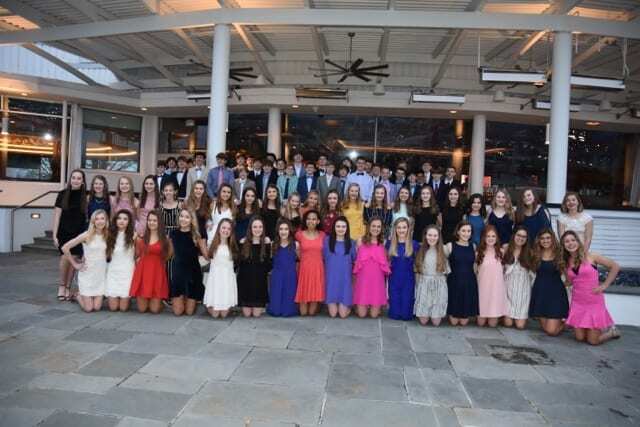 The Birmingham Etiquette & Protocol Academy hosted a dinner and dance event on March 1 at The Club to celebrate the hard work of this year’s academy graduates. More than 90 eighth grade students attending Briarwood Christian School made up the academy’s graduating class. Participants took part in four lessons that educated them on dining etiquette and dancing skills. At the dinner and dance, the class members showed off their new skills during a multi-course dinner, followed by a dance where they displayed skills in a variety of swing dancing. The academy’s purpose is to reach and teach young minds by providing etiquette lessons for both casual and formal social settings.